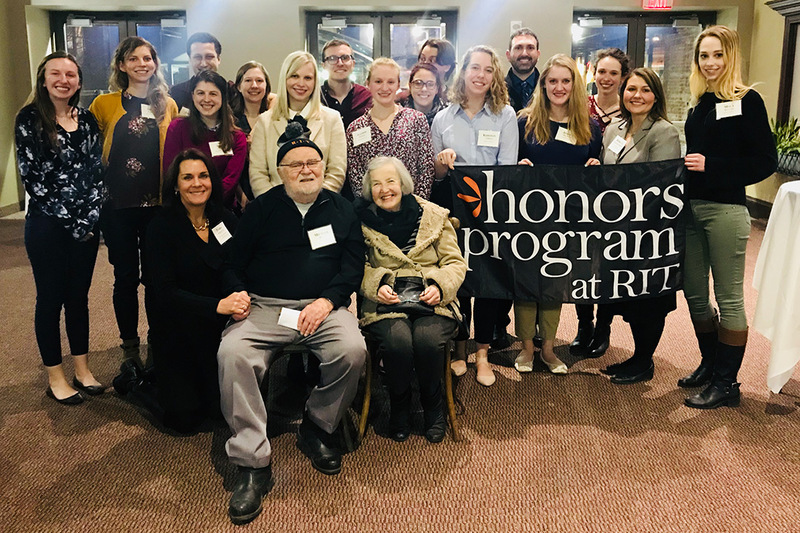 Mike Blain ’57 (printing) and his wife, Sylvia, both seated, talked with College of Health Sciences and Technology Honors students in Cleveland this spring. The students visited Cleveland with Tamra Werner ’91, director of Alumni Relations, kneeling, to network with alumni. The students and alumni surprised Blain by celebrating his 90th birthday. By 1954, Mike Blain ’57 (printing) had survived the Holocaust and the Korean War and wanted a college education. The 26-year-old was interested in printing and journalism, so he went to the Veterans Administration in Manhattan for advice on where to go to school. He finished college in three years by going to summer school, worked as an associate editor for Reporter magazine and started Hillel, the Jewish student group that continues 64 years later. The accomplishments are among a long list that 90-year-old Blain can celebrate today. Of the 13 members in Blain’s immediate family, he was one of only three to survive the Holocaust. He survived, he said, because of a number of lucky breaks, including leaving Czechoslovakia and moving to Budapest, Hungary, at the age of 14. His family in Czechoslovakia was sent to Auschwitz concentration camp in 1944. After the war, he joined a group of orphaned Holocaust survivors, who were taken to London. In 1949, he moved to New York and was later drafted by the U.S. Army to fight in Korea. When he started college, Blain said, he became involved with the Hillel chapter at the University of Rochester because there wasn’t one at RIT. But one night he was at an interfaith dinner with Catholic and Protestant RIT students when the chaplain said the next dinner would be hosted by Hillel. Today, RIT Hillel serves 30 students, said Nora Chernov, Jewish student life engagement coordinator. “Without Hillel there is simply no way we could even start to meet the needs of Jewish students and build the strong and intimate community that Jewish life at RIT has become,” she said. After RIT, Blain moved to Cleveland to work for the World Publishing Co. In 1971, he was transferred to Indianapolis, where he later joined the Israel Bonds organization. He retired in 2007 after 33 years as executive director of Israel Bonds. Blain and his wife, Sylvia, have three sons, 12 grandchildren and 17 great grandchildren, and now live in Cleveland. Along the way, Blain has stayed involved. He lectures and frequently speaks to student groups about the Holocaust, volunteers for organizations and writes for Jewish newspapers. He is the recipient of many awards and honors.